What an honor it is to be participating in the Champions for Kids and All You magazine simple service project. I have shopped at Walmart with my coupons and bought items to donate to an organization that benefits children. 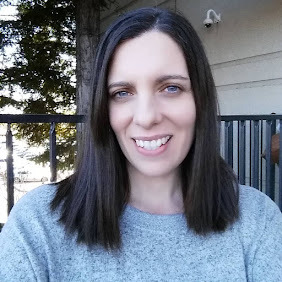 I have chosen to make my donation to the Kingston Food Bank in Washington state. I have chosen this organization because no child should go hungry, and food banks play a vitally important part of any community. My grandson went with me to shop for our donations, and here he is with a smile on his face and all ready to take our things into the food bank. The food bank is run by Director Barb Fulton (she is the lady in the front row, on the right). Barb's parents started the food bank 55 years ago. 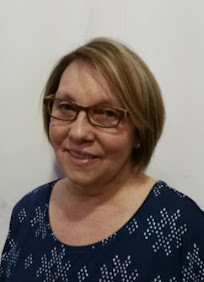 Barb is generously devoted to continuing on the tradition of helping others in need. These other marvelous ladies devote their time to helping out here, and helping to make sure that families can come to the food bank when they need to. Kid's clothes, blankets and other items are always needed. Warm jackets and gloves in the winter are always welcomed and used. Donated buckets and bunnies will help to fill Easter baskets for the children. Our thanks also to Barb Fulton and the Kingston Food Bank for all you do for the community. 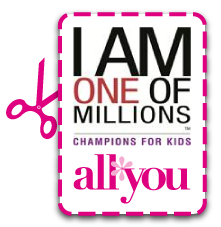 Champions for Kids is a great way to get ideas for a Simple Service Project each month that anyone can participate in. Using coupons is a great way all year long to be able to give more and save more while helping kids in need. 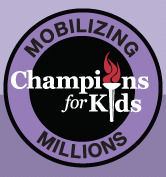 You can read more about Champions for Kids by visiting their website. Your grandson looks so happy to be with you on your mission! What a wonderful thing to do! So great that your grandson got to go with you! All my kiddos were sick today when I dropped a donation off at Turning Point so I left them at home so we wouldn't spread our germs. Wonderful photos! I live in Oregon right by the border of Washington, so it's cool to see an organization in the Pacific NW! This is such a great project, thanks for sharing. yay! What a great story behind this charity. It's not often you see it started and run by a family for so long. Definitely the story of this food bank is amazing! what a great job you did on this project!